With the new noggin it was considerably more convenient to bottle the ready fermented tea. 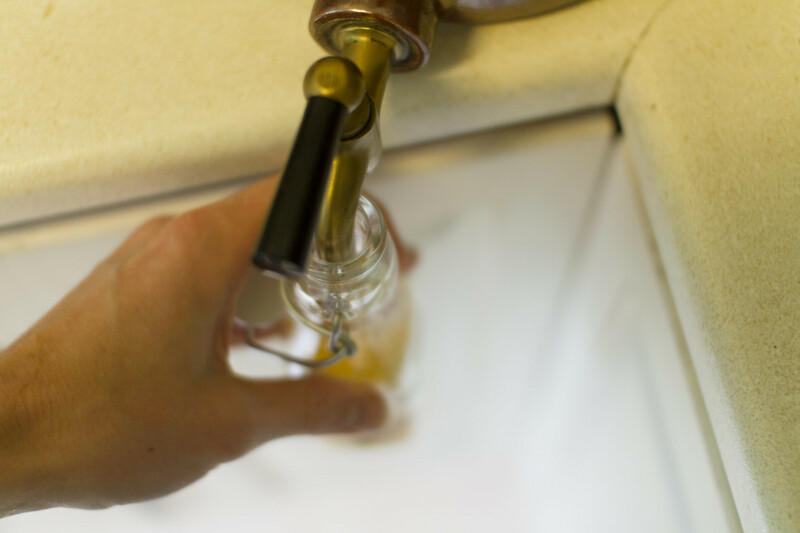 Rather than having to pour the Kombucha between several smaller noggins we could simply turn the tap and let the Kombucha fill the bottle. Bottling the Kombucha from the new noggin. This time we wanted to try a few new flavours. 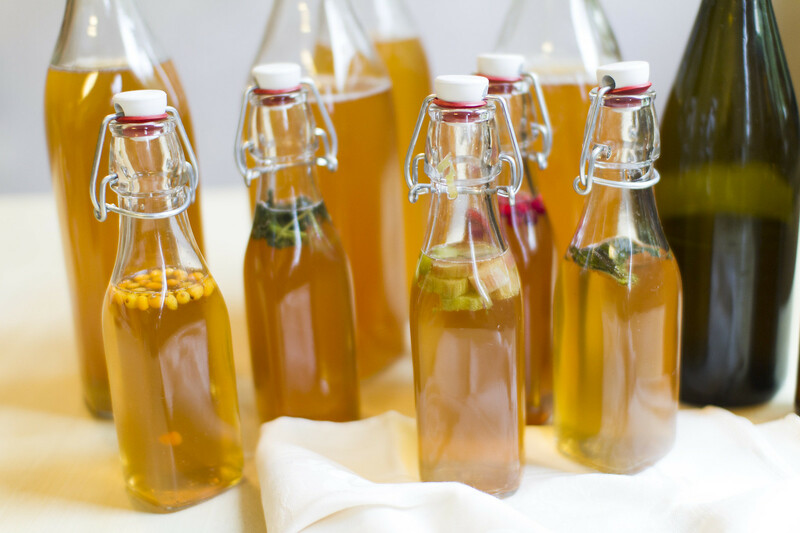 Together with our favourites from last time, lingon berry and sea buckthorn, we used lemon balm, mint and rhubarbs. The herbs and rhubarbs we managed to get from my parents’ herb garden, so they are fresh and should provide nice flavours, hopefully. It will be interesting to try and see how well they turn out. The new flavours, rhubarb, lemon balm, mint, lingon berry and sea buckthorn. 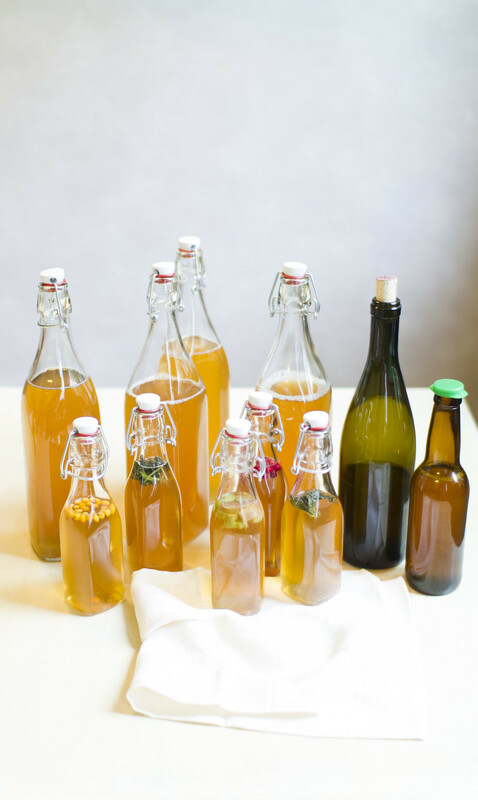 As usual we will let the bottles with the ready Kombucha and the herbs/berries ferment for another few days in room temperature before we move them to the fridge and start drinking them. The newly bottled Kombucha with the new flavours. Having the new noggin we had a total of about 12 liters of ready Kombucha. 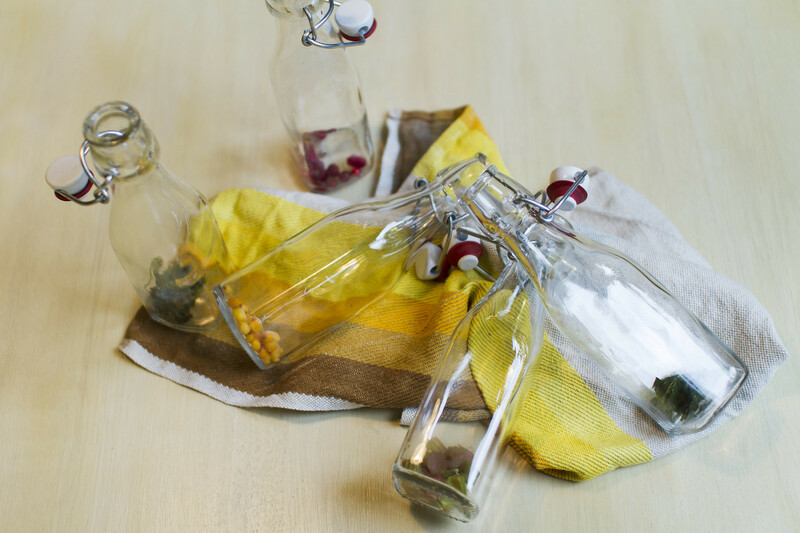 For that we have got some new glass bottles and we also thought we might try reusing a wine bottle. For the new batch we brewed another 11 liters of tea to fill all the noggins, it is not as easy as it sounds to handle such a large amount of tea, when the larges vessels that we have a available are about 6 liters… It is really interesting to see how quickly we have been able to scale the batches, starting from only about a liter, we can now make more than we are able to drink between the batches. All the bottled Kombucha from this batch. Anyways, the bottling went smoothly as did the new brew, eventually at least. So, now we wait for another ten days for the new batch to be ready. We will be back with a review of the new flavours as well, so make sure to keep tuned. 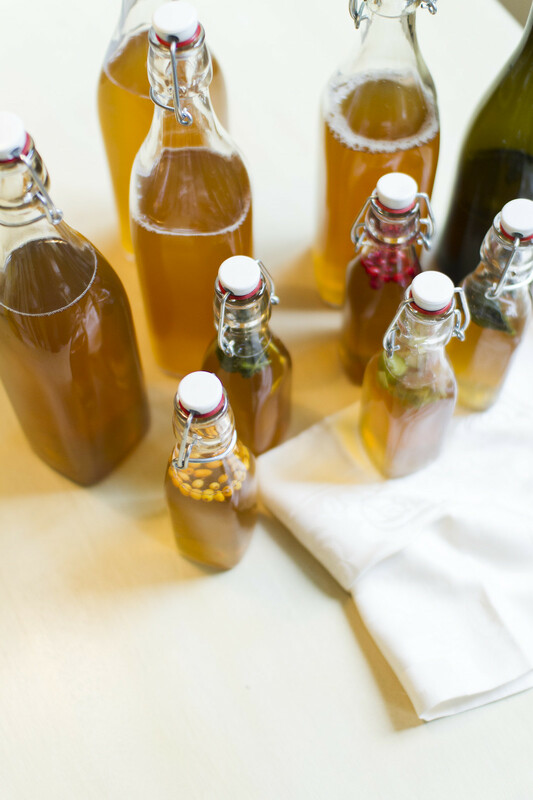 The sea buckthorn flavoured Kombucha together with the rest of the batch ready for the second fermentation.